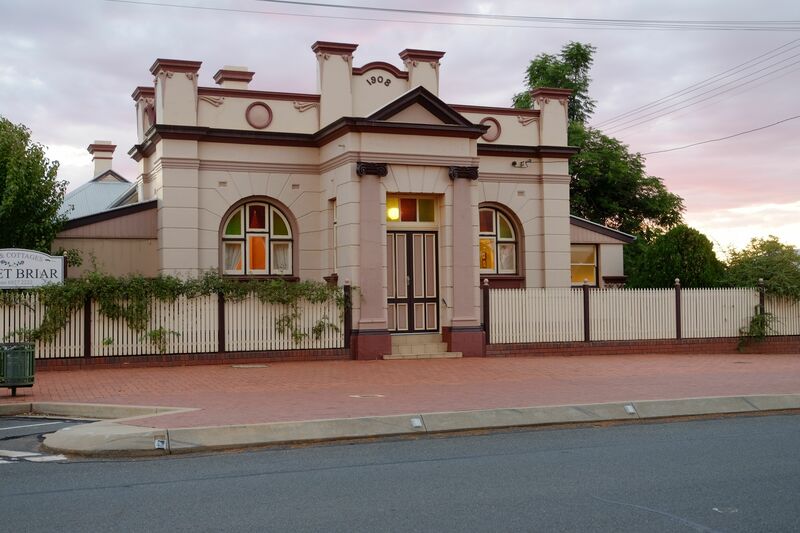 Sweet Briar Bed and Breakfast Accommodation is located on the main street of Coolamon, close to all the main amenities. The former Bank of NSW built in 1887, captures the grandeur, style and romance of a by-gone era. While keeping the features such as pressed metal ceilings, claw foot baths and classic furnishings, the three beautiful bedrooms and ensuites provide every modern luxury. In addition to this there is a guest lounge room, breakfast room and two self contained country style cottages. The cottages are overlooking a pretty courtyard with manicured gardens and lawns. Andre and Keryl invite you to come and enjoy country hospitality and all that Coolamon and the surrounding districts have to offer. We are very excited that Sweet Briar B&B has featured on the Sydney Weekender program aired on the 12th of November 2017. We were fortunate enough to have the host, Mike Whitney and his crew stay with us while they did a segment on the Coolamon Cheese Factory. Our inclusion in the spring edition 2017 of the Central West Lifestyle Magazine has also been a real highlight. It’s a beautiful high quality magazine showcasing the central west in all it’s beauty.